Thanks to our sponsor Flower Power for this great article. 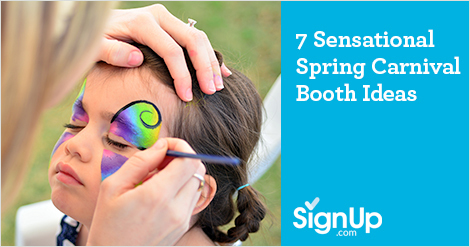 Whether your town or school’s Spring carnival is a time-honored tradition or a relatively new event, the key is to keep continually improving and refreshing the event to keep your attendees happy, energized and coming back year after year. Here are seven ideas for booths to spice up this beloved annual community party! Something to Take Home. Everyone loves to have a photograph commemorating a good time. This year, go beyond the photo booth! Ask among your volunteers for amateur or professional photographers to donate their skills. Decorate a colorful shower curtain with large plastic or tissue flowers to create a backdrop and set up a giant planter in front. Pose kids and/or families as the flowers in the pot. Set up a digital photo printer and you have an instant memory generator! Bonus: encourage parents to take photos with their smartphones and tag the event on social media like Instagram, Facebook and Snapchat. Harness Their Star Power! Set up a Karaoke machine and a mini-stage, and watch the fun. Or rope-off a dance party area with a kid-friendly sound-track. You could even enlist the help of a local dance teacher, hula hoop artist, or baton twirler to teach the attendees a quick routine in 15 minute shifts. Green and Beautiful Fundraiser! After months of cold, dreary weather, people can’t wait to watch things bloom and grow. Set up a few computers with wifi access or set out catalogs and let your attendees order plants and bulbs from Flower Power Fundraising. You keep fully 50% of the sales, and Flower Power will ship directly to the buyers when the time is right for planting. There’s no minimum order, no up-front cost, no complicated product distribution -- and the products are 100% guaranteed so there’s no risk! What could be more spring-like than planning and planting a garden? Spring Animals. Hire a mobile petting zoo to bring lambs, baby goats, ducklings and bunnies and set up a safe and shaded corral. Have plenty of approved animal snacks and sanitizing wipes on hand for visitors. Tried and True Favorites. Don’t forget to give the people what they love! Take stock of what you’ve done in the past (or research what other organizations have done if you’re new to this.) Keep the booths and games your community loves best, especially those that are traditional to spring carnivals like the dunking booth, cake walk, fish pond and face painting (encouraging spring themes like flowers, butterflies and lady bugs).. Unusual Art. Hold a canned food sculpture contest and donate the food to the local food bank, or conduct a chalk art contest in the parking lot. Reward the teams that win with tickets to cut in line on the rides or bouncy house. Showcase Your Community. Invite summer camps, martial arts studios, dance teams, etc. to sign up to perform an exhibition. This is a great way to educate your audience about community offerings, boost carnival attendance, and to create excitement on the grounds. Enjoy your Spring carnival, it’s a great opportunity for the community to come together in the pursuit of fun! Looking for more great fundraising ideas, check out our Ongoing Ways to Celebrate the Earth at School.